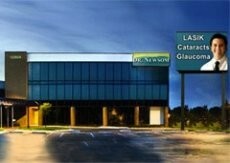 Newsom Eye is known worldwide for their surgical skills and experience. The clinic offers a full range of eye care services. I had by far the best experience I've had in years at a medical appointment today at Newsome Eye. Dr. Garruto and the staff I worked with Kaitlin, Alina, and Paloma were all incredibly personable, efficient, and professional. Their interpersonal skills are terrific and their sense of caring for the patient's comfort and well-being is awesome. They were precisely on time there was virtually no wait time at any step in the entire process. I would recommend Newsom Eye in general and Dr. Garruto in particular to anyone who is looking for expert and patient-friendly medical treatment. Staff fabulous! Love this place! Amy was more than efficient. Had a post op complication & she handled it right away and told me which office to go to! Staff took me back by 8:20. Saw doctor by 8:40, procedure completed and left office by 9:20. Staff took my husband back shortly. Loved my results and experience. I am very happy with Newsom Eyes and would recommend to anyone in Tampa Bay Area. Dr. El- Jabali has taken a very tough situation and made if as absolutely pleasurable as possible. I can’t tell you how grateful I am to have him as my doctor. Glad for reminder calls for appointments. Understand surgery can go on. Could have been told reason wait so long. Love Dr. Forde and staff. Michelle B was pleasant and informative. Suggestion: Send a gift card with thank you note for referrals. Michelle was very professional and patient care about her patients. Michelle B was very helpful through, friendly an asset to Newsom eye. Michelle is very friendly and professional. Very approachable, a real joy to be around. Very professional and patient which is very appreciated. Staff great Dr. Petit the best Brittany in S. Tampa. (Tech) was very kind and helpful. Excellent care. Especially Paloma and her help when I didn't feel well during procedure. Had a super tech today- Sherrie- and really appreciate the good care I received. Very informative. Had been a little disillusioned with the clinic, but Sherrie Changed that. Dr. Forde and staff are awesome! Thank you for all of your help addressing my concerns. I can see now! Fixed my dry eyes too! Delightful person very professional / competent. She has been very attentive. I miss the I love Lucy Re-runs. The little rascals, though funny to some, is quite offensive because of the way the African-American characters are portrayed. Thanks for listening. Assistant great, helped with nervous. Doctor was great also.